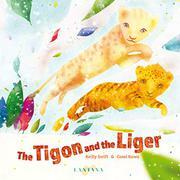 Rhyming verse sends a message of acceptance for differences in this story about two tigon and liger cubs who find friendship with each other after being rejected by others. The introductory text explains that a tigon has a tiger father and a lioness mother and is smaller than typical lions, while a liger has a lion father and a tigress mother and is larger than typical tigers. Separately, the cubs are shunned by both lions and tigers, and they flee. When they find each other, they enjoy an immediate sense of comfort and companionship, which ameliorates the hurt they’ve sustained. Eventually, lion and tiger cubs see how much fun the pair is having, and they ask to join in. These actions spur the entire communities of lions and tigers to accept the once-shunned tigon and liger, as well as diversity writ large across species: “They now knew it matters / not one little jot, / who’s big or who’s small, / who has stripes or has spots. // And that goes for… / zedonks and zorses / and all wallaroos, / pumapards, leopons, / and most of all…YOU!” Ultimately the quick-fix, tidy ending undermines the veracity of any real-world application of the story’s message as implied by the closing direct address. Would that it were so easy to dismantle the cruelty meted out against people somehow deemed other.